Dwight P. Williams Signature Series™ 1% x 3% AR-AFFF is UL approved and designed to be the most effective foam on fuel in depth type fire as demonstrated by performance on the Dwight Williams Plunge test. The plunge test was developed by Dwight Williams in the late 80’s to be the most rigorous fire test protocol by subjecting foam concentrates to direct impingement on the fuel surface in a forceful application testing the foam’s ability to extinguish, resist fuel pick-up, and provide superior burn-back resistance. The Signature Series Foam is the cleanest AR-AFFF on the market today with the most versatile and effective firefighting foam capabilities for emergency response scenarios and is proportioned at 1% for hydrocarbon fuel fires and 3% for polar solvent fuel fires. 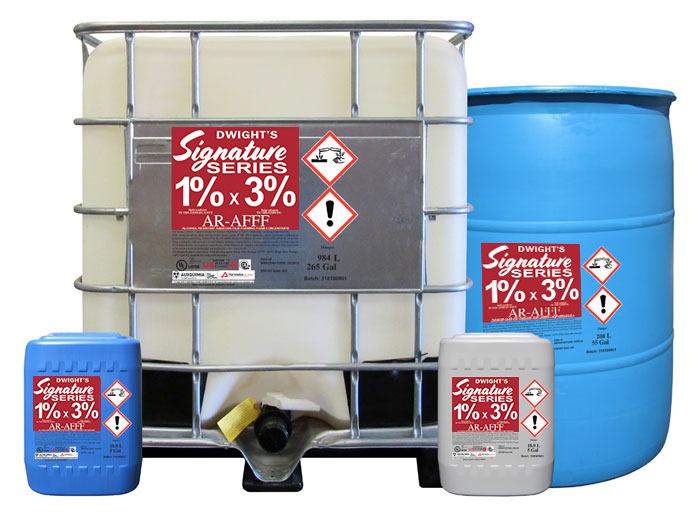 Dwight P. Williams Signature Series™ 1% x 3% AR-AFFF is a mixture of water, hydrocarbon surfactants, solvents, C6 fluorosurfactants and fluoropolymers. Dwight P. Williams Signature Series™ 1% x 3% AR-AFFF can be used with standard proportioning equipment, foam discharge devices, inline foam proportioners, and self educting nozzles. FOR DETAILED SAFETY INFORMATION, please refer to the SDS. Precautionary Measure and First Aid: Handle in accordance with good industrial hygiene and safety practices. These practices include avoiding unnecessary contact and removal of the material from the eyes, skin and clothing. Eye Protection: As a good industrial practice, the use of chemical goggles is recommended. If in the eyes, flush immediately with water. Eye flushing equipment should also be available. Skin Protection: Wear protective gloves when handling concentrate to minimize skin contact. Wash hands and contaminated skin after handling. Respiratory Protection: None required. The location for public viewing of the SDS is on www.SignatureSeriesFoam.com. Dwight P. Williams Signature Series™ 1% x 3% AR-AFFF is used in emergency response situations, fire suppression systems, and manual applications to fight a broad range of Class B flammable liquid fires including hydrocarbon fuels such as gasoline and diesel, and on polar solvent fuels such as ketones and alcohols. Typical applications include storage tanks, loading racks, docks, process areas, and warehouses. It is an excellent vapor suppressor for flammable liquid spills. The shelf life of any foam concentrate is maximized by proper storage conditions and maintenance. Factors affecting shelf life are wide temperature changes, extreme high or low temperatures, evaporation, dilution, and contamination by foreign materials. Properly stored Dwight P. Williams Signature Series™ 1% x 3% AR-AFFF foam concentrates should have no significant loss of firefighting performance for 20+ years. However, the National Fire Protection Association (NFPA) recommends annual testing of all firefighting foams. 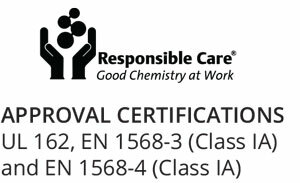 The concentrate should be stored at temperatures between 20˚F (-6˚C) and 122˚F (+50˚C), preferably in the original containers, approved bladder tanks, stainless steel, high density polyethylene, fiberglass or epoxy lined tanks. Concentrate piping acceptable materials of construction include stainless steel (either 304 or 316), some plastic piping including fiberglass and PVC, red brass, and black iron as long as the system is completely flooded eliminating the air/foam concentrate/carbon steel interface. Avoid permanent contact with carbon steel, iron, some copper alloys, and aluminum when the piping material and concentrate will be exposed to air. Galvanized piping is not recommended for AFFF piping systems. Foam concentrates are subject to evaporation, which accelerates when the product is exposed to air. Storage tanks should be sealed and fitted with a pressure vacuum vent to prevent free exchange of air. Although the information and recommendations set forth herein (hereinafter “information”) are presented in good faith and believed to be correct as of the date hereof, US FIRE PUMP and its affiliates makes no representations or warranties as to the completeness or accuracy thereof. nformation is supplied on the condition that the persons receiving same will make their own determination as to its suitability for their purposes prior to use. In no event will US FIRE PUMP be responsible for damages of any nature whatsoever resulting from the use of or reliance upon information or the product to which the information refers. Nothing contained herein is to be construed as a recommendation to use any product, process, equipment or formulation in conflict with any patent, and US FIRE PUMP makes no representation or warranty, express or implied, that the use thereof will not infringe any patent. NO REPRESENTATIONS OR WARRANTIES, EITHER EXPRESSED OR IMPLIED, OF MERCHANTABILITY, FITNESS FOR A PARTICULAR PURPOSE OR OF ANY OTHER NATURE ARE MADE HEREUNDER WITH RESPECT TO INFORMATION OR THE PRODUCT TO WHICH INFORMATION REFERS. © US FIRE PUMP. All rights reserved.